How do you feel? Or is it, how do you feel? The actors of Spellbound Theatre’s “The World Inside Me” can help you answer both of these questions about how our bodies and minds work as they sing, dance, and interact with the audience during the forty-five (or thirty, depending on audience age) minute show, playing March 29th to April 7th (show times and details below) at The Duke on 42nd Street (229 W 42nd St., Manhattan). The Duke is an intimate and fun creative space, perfect for a show geared toward little, creative audience members. This was our first visit to the partner of The New Victory, housed just two doors down. If you haven’t enjoyed performances showing at The New 42nd Street theaters, you must check out the upcoming events schedule. Coco (aged 4) and I took advantage of the amazing spring weather in New York this weekend to take in the performance. Upon entering the theater space, we found a cubby for our shoes and joined the rest of the families in the interactive discovery area. The location, descriptions, and functions of the human heart, lungs, digestive system, and brain were laid out in fun stations manned by helpers who encouraged and taught us along the way. Coco especially enjoyed taking the play food through the tummy tunnels and depositing them in the bucket “toilet” at the other end. What can I say—she’s that kid. The helpers also handed out various felt shapes for the children to bring into the show to take on stage when prompted. At showtime, we were introduced to Sarah, Melana, Jono, and WT who are the performers and some of the co-creators of “The World Inside Me”. Jono played his soprano banjo and sang along with the others as we entered the cozy stage area with bench and cushion seating all within easy reach of the acting space, enriched with digital display. From minute one, the actors engaged the children (and encouraged the parents) in singing along, dancing, and learning about the hows and whats of our bodies. Despite Coco’s enjoyment of all things toot and poo, the show remains quite sweet and fun without relying on bathroom humor to carry it. At different times, audience members are encouraged to either stay seated or join the performance. We even got colorful band-aids to help heal imaginary boo-boos, which was a huge hit! Jono’s running background soundtrack and commentary held some great humorous bits that had parents chuckling while the kids were absorbed with stage activity. The running time kept everyone interested and excited. We used our senses and grooved along the whole time. I encourage all families with children under five checkout this show! We had a beautiful and exciting visit. Coco especially loved sorting nerve cells and having her picture taken with the cast at the end. One of my personal favorite pieces of “The World Inside Me” is the message that people of different shapes and sizes have the same parts inside. A multi-cultural and ability cast helps highlight this, and they are offering a sign-interpreted performance April 6th at 4pm. It’s a great inclusive event; I hope you’re able to grab tickets and make it this coming weekend! **Wobbly first steps, ouchie boo-boos, funny faces and lilting lullabies. THE WORLD INSIDE ME uses gentle interactive play, live music, dance and visual effects to illustrate the inner life of our growing bodies. 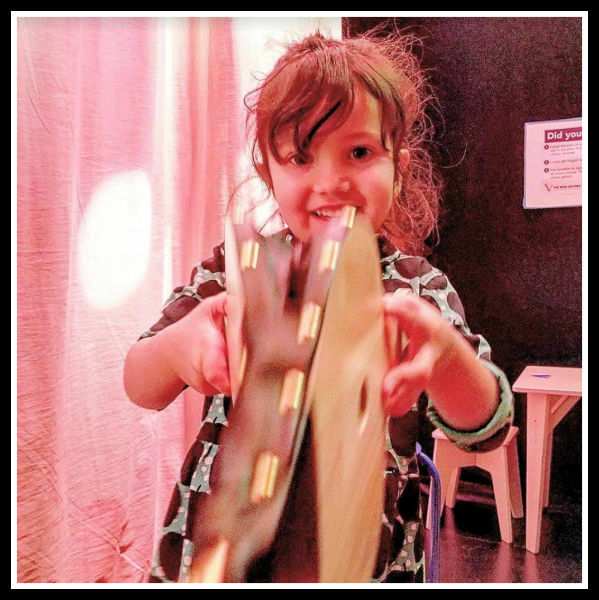 Explore the sights, sounds and sensory surprises that come with each new day in this innovative production, presented in two iterations: one for ages 0-2 and another for ages 2-4. 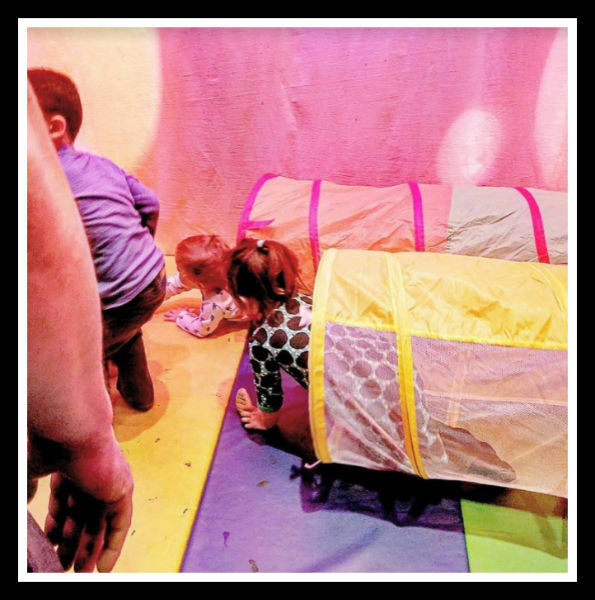 The version for older toddlers allows pint-size audience members to play doctor when performers acquire bumps and bruises, while the show for infants focuses more on sensory moments like peek-a-boo and sorting cell shapes. Catch this show with your favorite little one at The Duke on 42nd Street from March 29 – April 7, 2019! Spellbound Theatre, named the American Alliance for Theater and Education’s 2017 Outstanding New Children’s Theater Company, is a leader in the emerging field of American theater devoted to creating original, multi-disciplinary performance for the very young. Spellbound crafts immediate, personal and magical theatrical experiences that spark a life-long relationship with the performing arts. Now in its sixth year of operation, the company produces original plays for audiences ages 0-5 and conducts early childhood education programs and community events for families. 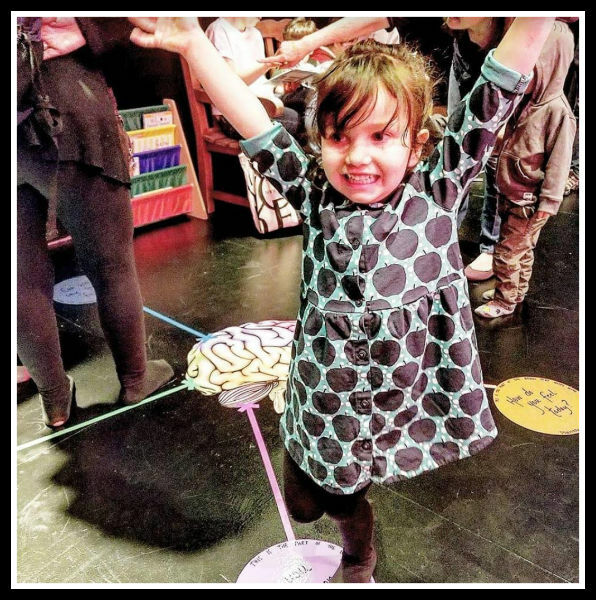 Best known for their rich, sensory performance style, Spellbound creates theater for a wide range of venues like tiny stories in a basket that can travel into a classroom, immersive and tactile studio shows and full-scale productions for mid-sized theaters. They have performed to sold-out family audiences as a multi-year company-in-residence at the Old Stone House in Park Slope, Brooklyn, and have been 2014-15, 2016-17 and 2018-19 New Victory Theater LabWorks Artists. 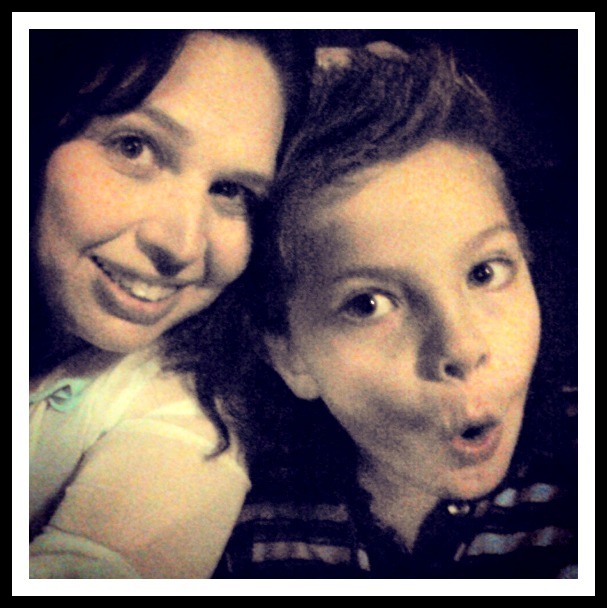 In recognition of their innovative work in theater for young audiences, Spellbound has received multiple grant awards from The Jim Henson Foundation, the New York State Council on the Arts administered through the Brooklyn Arts Council, and the NYC Department of Cultural Affairs. THE WORLD INSIDE ME features performers and co-creators Sarah Folkins, Melana Lloyd, and WT McRae. Directed and co-created by Lauren Jost, co-created by Christine Dehne, Original Music and Lyrics written and performed by Jono Waldman, choreographed by Alexandria Wailes. Creative and Production team include Will Bishop (Scenic, Props), Becca Jeffords (Lighting Design), Liviu Parsare (Projection Design), Rebecca Gerrard (Touring Production Manager, Understudy), Jacqueline Russell (Artistic Director and Co-Founder, Chicago Children’s Theatre). Chicago Children’s Theatre (Co-Producer), Emily Baldwin (Rehearsal Stage Manager), Samantha Rausch (Technical Director), Spencer Gjerde (Props Artisan), Ilyssa Kosova (Props Artisan) and Ellie Terrell (Props Artisan). Further development of this piece is supported through The Alliance of Resident Theatres (ART/NY) and the CreateNYC Disability Forward Fund through the New York City Department of Cultural Affairs. Learn more about THE WORLD INSIDE ME at NewVictory.org. 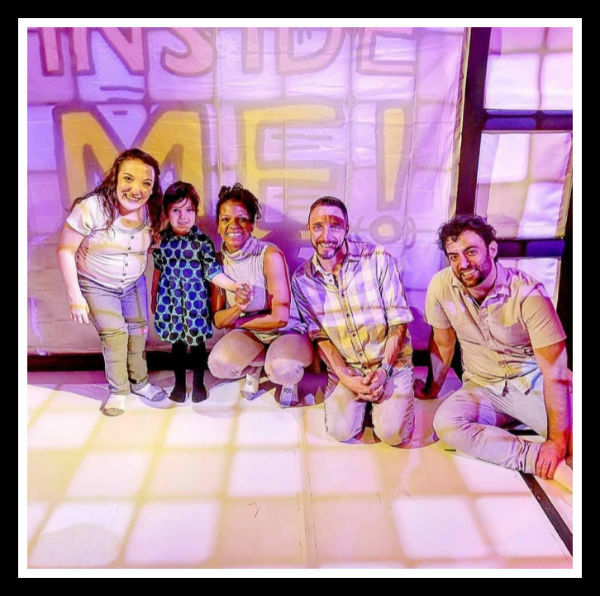 THE WORLD INSIDE ME, performing at The Duke on 42nd Street (229 West 42nd Street) has a running time of 30 minutes with no intermission for ages 0-2 and a running time of 45 minutes with no intermission for ages 2-4. Ticket Information Full-price tickets for THE WORLD INSIDE ME are $20. Tickets are available online (http://www.newvictory.org/boxoffice) and by phone (646.223.3010). To purchase tickets in person, the New Victory box office is located at 209 West 42nd Street (between 7th / 8th Avenues). Box office hours are Sunday & Monday from 11am-5pm and Tuesday through Saturday from 12pm-7pm.